This article is about the fly species. For the family, see Piophilidae. 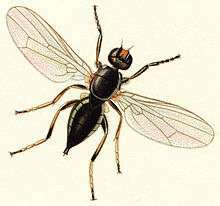 The cheese fly (Piophila casei) is a species of fly known for infesting human foodstuffs. The larvae of this fly are known as cheese skippers due to their ability to launch themselves several inches into the air when alarmed. When consumed accidentally, the larvae can survive in the intestine, causing enteric myiasis. Cheese fly larvae are used to produce casu marzu, a traditional Sardinian cheese.